Use to beautify and protect tropical, exotic hardwoods from premature UV graying/silvering, mildew staining and water damage, including cracking and checking caused by moisture absorption. Maintains "like-new" appearance on new wood and restores weathered wood to its original, natural look. Imparts a translucent, matte finish. Translucent, natural brown tone reveals wood grain and texture; complements original wood color; maintains that brand-new, "wet" look. Concentrated UV blocker/absorber combination prolongs coating color, resists premature fading, and reduces maintenance. Immediate application to new wood prevents premature UV damage. 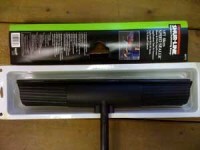 Mildew-resistant coating film keeps surface free of mildew stain. Long-term water repellency exceeds Federal specifications. Protects against cracking, splitting, warping. Penetrating oils optimize adhesion and durability, and renew weathered wood. Fast, easy water clean up. Quick drying, one-coat coverage saves time and effort. Clean and coat in one day! 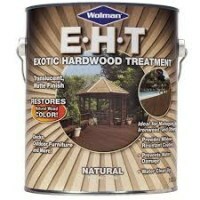 Can Wolman's EHT sealant be shipped to/ purchased in California?? How do I remove EHT from aluminum spindles? They are vertical spindles on my deck's railing. When EHT was applied, some of it was brushed onto the aluminum spindles and dried. Recently a deck cleaner was appiled and made the 'over brush' appear as a white residue. It does not wipe off. Can you recommend something to remove it? No idea as to the greenish color. I would suggest contacting the maufacturer. I've been in new home about 1 1/2 years....deck needs to be redone. I bought some EHT (what was originally used) and tested a small area. I shook the can and opened it and it was a kind of olive green color which I thought was odd. I tested a an area about the size of the palm of my hand and it dried to a slightly darker olive greenish brown color....not the rich brown that the deck was before it started fading. Any suggestions or ideas as to why the strange color? Beading water is not important when it comes to deck stains. This is a misconception of the public from watching all those Thompson's commercials. In reality the stain should "shed" water but not "bead"
The best way to tell if the rain affected the stain is to see if there is any lifting residue, looks blotchy, or separation circle spots. If not then I would not worry about it.